There is a video collating our photos from the trip and the post follows the order of the video !! I was visiting home for a break in summers of 2006 after the grueling first year in engineering at IIT Guwahati. Days were passing by event-less and boredom gradually dawning. 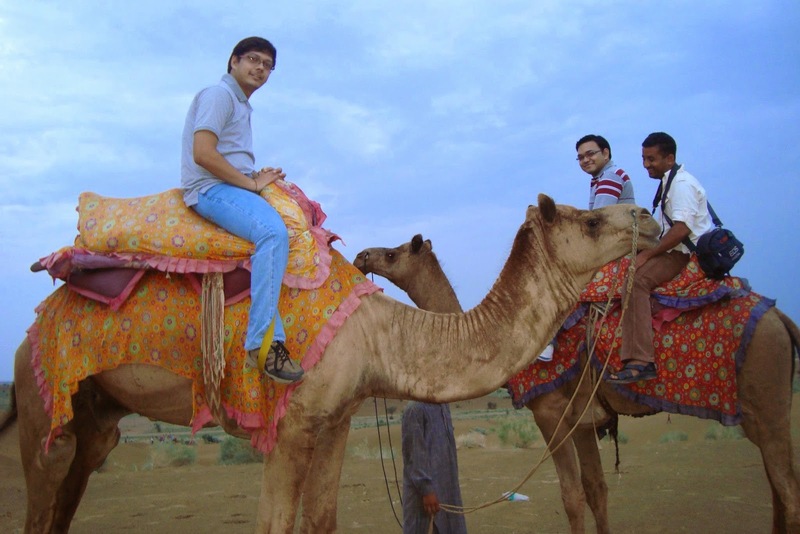 And then suddenly I was making a plan to visit the most western cities of India - Jaisalmer and Jodhpur. This post deals with the former and would soon post the later part of journey in a new post. Finally we set rolling. As dad was on official trip we were going to get the Special saloon for our ride. The royal carriage meant for inspections is virtually a luxury suite on wheels. I may probably put down thoughts on that suite in another post. After the whole night of travel we were finally treated by a sumptuous breakfast on route. The journey after showed us some interesting scenes. The caretaker advised to keep the windows tightly closed. Obviously listening to advises was never meant for me and hence the whole carriage was full of sand along with me covered with it at the end of journey. But finally we were there in Jaisalmer - The Golden City !! After freshening up it was time to hit the city. As soon as one enters the city aptness of the nickname becomes apparent. The dull yellow colour of Jaisalmer stone makes the difference and gives the city a golden shade. The sparsely populated town with its richness of art and culture truely deserves to be a destination of "Palace on wheels". The first spot on our list was the Jaisalmer Fort. The grand fort was fabulous combination of art ,architecture and strategic planning. 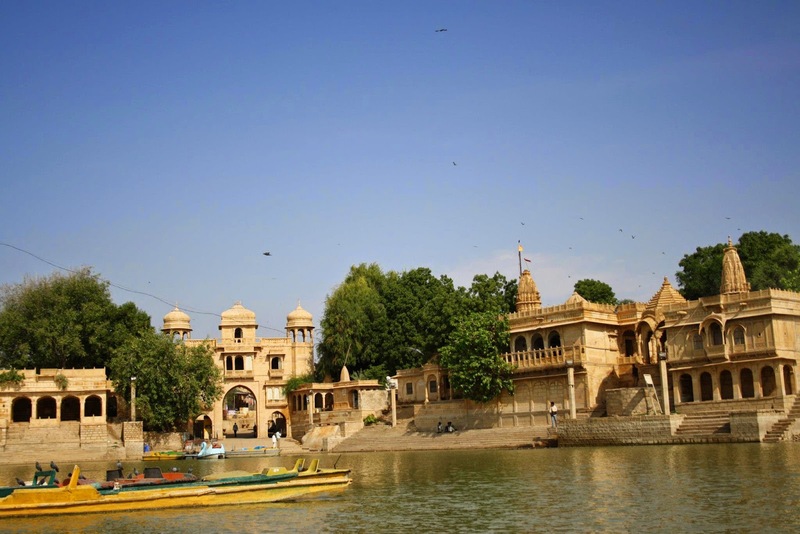 It was built by Rajput Raja Jaisal and the city has been named after him. The sandstone walls of the fort give it too a golden look during dusk. A large part of the city still fall within the boundaries of this wall. There is a palace within the fort -Raj Mahal- which has a huge collection from that era. The view of the city from the top of the palace is awesome as is the view of the periphery of the fort. The marvelous architecture of the era is also evident in numerous "Havelis" which are still standing tall to tell their stories. The whole environment spells the meaning of grandeur of the royal life. So our next stop was at on of those, called Patwon-ki-Haweli. Next we visited a less popular place called Khuri which impressed us with its mud huts amidst the base of sand. The way these were built and still exist leads one to thing about the expertise of the olden days. And as if this was not enough for a day, we were informed about a place around 45 kms from the city center called "Sam".Now what's it ???? Its the place for which one tours Rajasthan..no credits for guessing!!! Here one is amidst sand all around and sand dunes changing positions infront of eyes within hours. And once you are in sand and wish to delve deep into the zone, the ride of desert - Camel - is there to save the effort. A long camel ride took me into deapth of sea of sand and then I realized how easy it can be to get lost in a desert. The day ended with a short stop at the Gadsisar lake in the city while on our way back from Sam. However the darkness in the sky did not allow for boating and hence we wrapped up our visit to embarked on further journey. However the excitement and fun wasn't over as we visited Jodhpur for a day before finally calling it off. So there's more to come from me for you..stay connected..! !